The history of relations between Jews and Christians has been a long, complex and often unsettled one. yet histories of medieval Christendom have traditionally paid only passing attention to the role played by Jews in a predominantly Christian society. This book provides an original survey of medieval Christian-Jewish relations encompassing England, Spain, France and Germany, and sheds light in the process on the major developments in medieval history between 1000 and 1300. 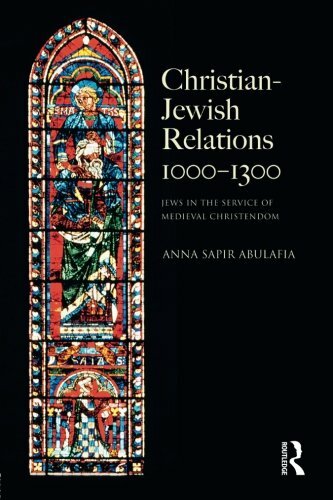 Anna Sapir Abulafia's balanced yet humane account offers a new perspective on Christian-Jewish relations by analysing the theological, socio-economic and political services Jews were required to render to medieval Christendom. The nature of Jewish service varied greatly as Christian rulers struggled to reconcile the desire to profit from the presence of Jewish men and women in their lands with conflicting theological notions about Judaism. Jews meanwhile had to deal with the many competing authorities and interests in the localities in which they lived. their continued presence hinged on a fine balance between theology and pragmatism. The book examines the impact of the Crusades on Christian-Jewish relations and analyses how anti-Jewish libels were used to define relations. Making adept use of both Latin and Hebrew sources, Abulafia draws on liturgical and exegetical material, and narrative, polemical and legal sources, to give a vivid and accurate sense of how Christians interacted with Jews and Jews with Christians.